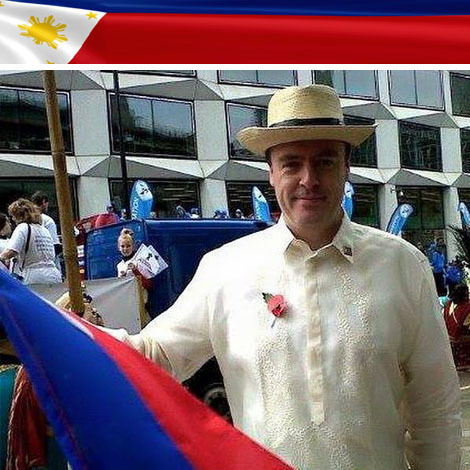 Known as the “British with a Filipino heart” and a solid Duterte supporter, Malcolm Conlan reacted to several photos of a priest, appeared to be campaigning against Anti - Federalism while presiding its own mass. The British expatriate also expressed his doubts towards the Catholic Church for tolerating such since he was always made to believe that the Bible teaches its followers to pray for the leaders of the country, reach out to the needy and promote unity and peace. It was found out eventually that the set of photos belonged to Manila Bulletin on Friday’s issue (July 13,2018) during a Parish Forum hosted by San Ildefonso Parish in Makati presented by Bishop Broderick Pabillo, as the priest presumably presiding a mass in the photo.
" 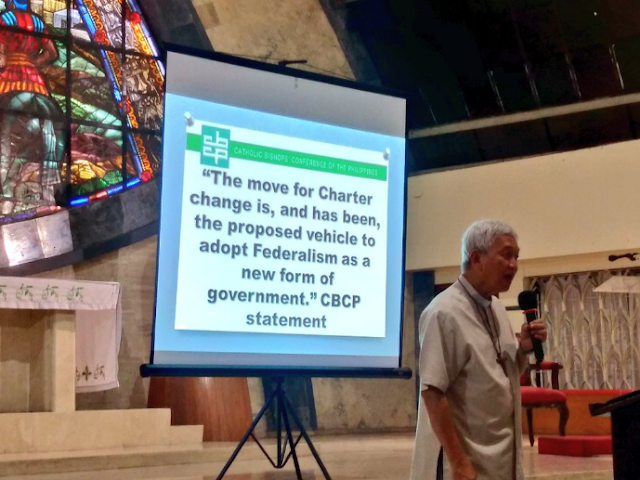 LOOK: Bishop Pabillo shares his analysis of the current Charter Change initiative: "Pres. Duterte wants to have control of the Judiciary & all Independent Commissions." 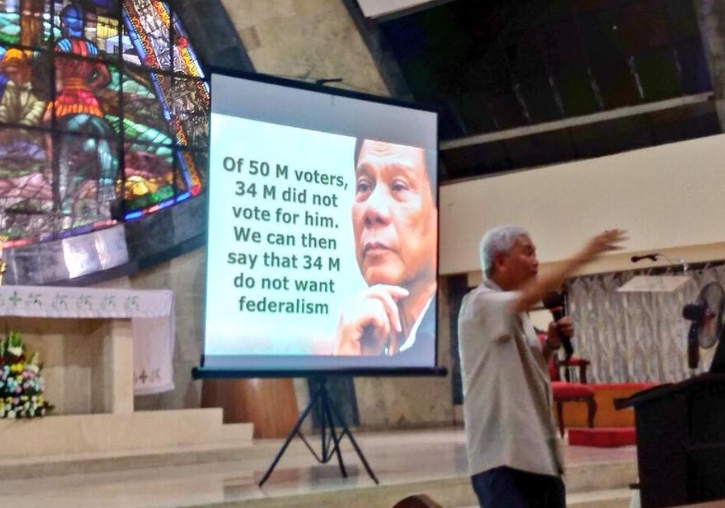 Bishop Pabillo doubted the proposed Charter Change would only prolong President Duterte’s term and pointed out that in his slideshow that ‘Imperial Manila’ got majority of the budget under the current administration – referring to urbanite snobbery. 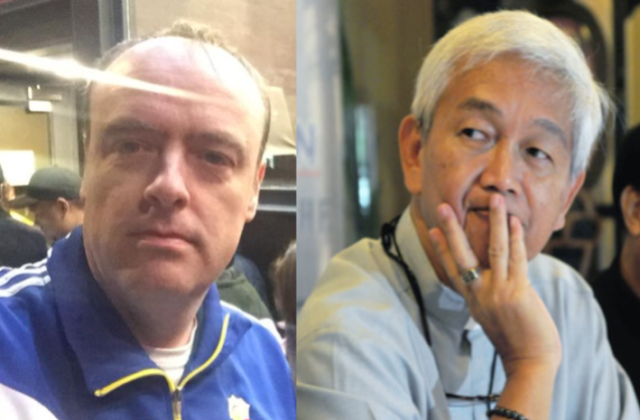 Pabillo claimed that the meeting between President Duterte and CBCP President Archbishop Romulo Valles was only a ‘PROPAGANDA’ and a photo – op. He also encouraged the people to stage protest against the President on the day of his State of the Nation Address. “Our main concern is not President Duterte. We are after the values our kids will have after his term,” he said. “Sorry dear friends, I’m not sure if this is a real account of what’s happening right now in the Philippines? Maybe it’s photo shopped? But just in case it is real, can someone explain to me why the Catholic Church in the Philippines is apparently meddling in politics? “I always thought that the role of Christians biblically was to pray for the leaders of the country, help the poor, pray for the sick, promote unity and peace? “Maybe I’m wrong, but this seems to be a campaign against the democratically elected President of the Philippines, Rodrigo Duterte and his political will??? ?